Despite having gone through so many ups and downs, Kashmiris are the people who can restore anyone’s faith in humanity. Be it the devastating floods of 2014 or the volunteers camps outside hospitals in 2016, the people of Kashmir face the challenge bravely defeat it hands down. One such example is of a young girl, Sana, who was diagnosed with ‘Relapse Acute Myeloid Leukemia’ (a type of blood cancer). The family had already spent huge sum of money on the treatment of Sana, and they were left with no money for further treatment for Sana. Mother does not work, while the father is no more so all the responsibility is on the siblings who were finding it almost impossible to make ends meet. She has been undergoing blood and platelet transfusion and soon, now that the financial crisis resolved, the doctors will start chemotherapy followed by ‘Allogenic Stem Cell Transplant’, a procedure which is very expensive but will ensure that her condition is improved. A campaign was started and support came from Kashmiris all around. Sana and her family saw a new ray of hope and within a few days the collections summed up to 25 lakhs. The week long campaign was started by ‘conscious’ citizens on social networks, and within a week an amount of Rs 25 lakhs was deposited in her account. “This campaign was started by concerned Kashmiris, and it is because of their efforts that we could get such a huge response,” said a person, wishing anonymity, who campaigned for Sana through his facebook account (reported Kashmir Life). “The campaign was started by two or three people but then everybody came in and tagged their friends for help. This reflects Kashmiri resilient character,” he added while thanking people who helped raise the money. Sana, 24, was first diagnosed with leukemia in 2015. 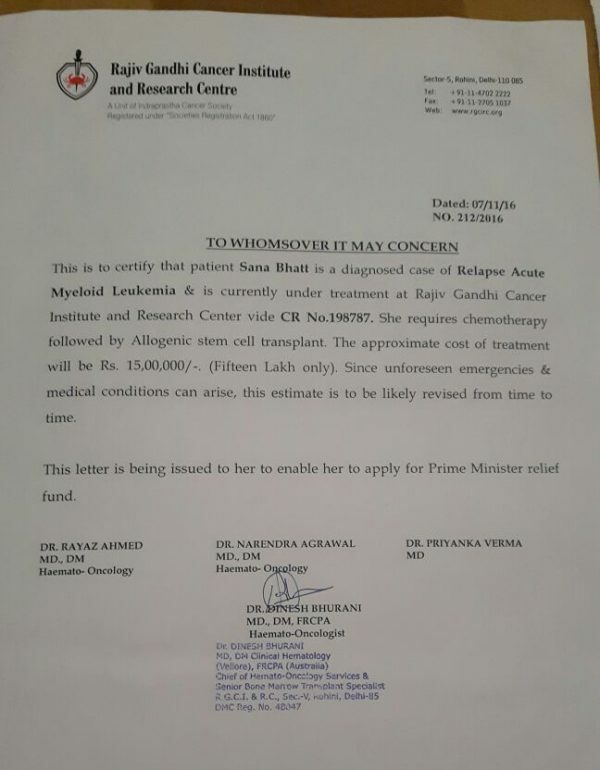 According to her family, they have already spent around Rs 16 lakh on her treatment in Fortis hospital, Delhi. However, a year later she relapsed. This time she had a stem cell transplant, which cost her family Rs 30 lakh. “We had to sell our ancestral land to meet the expenses,” said Sadia. Sana’s father died in 1995, and since then the two sisters along with their brother and mother are living in Magarmal Bagh, Srinagar. Despite the treatment Sana once again relapsed, but this time it was just after two months of transplant. Since July 2016, Sana along with her family is in Delhi for treatment. “All of our financial resources have drained out. 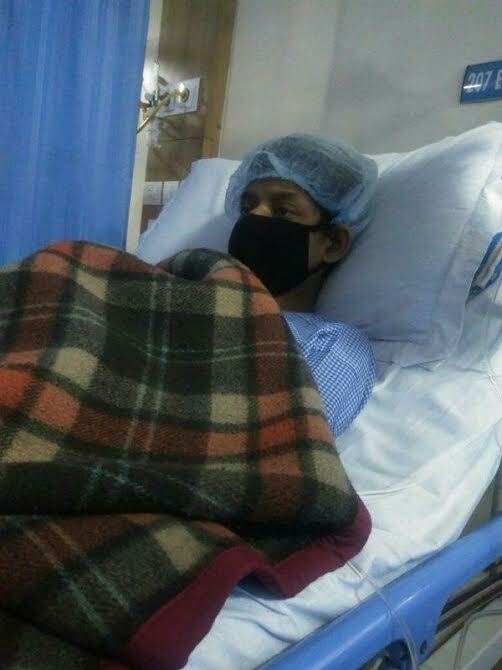 But due to some well wishers who shared Sana’s story on social networking sites, we are able to pay for her treatment. We are thankful to all of you,” said Sadia, while appealing donors to stop sending more money as the required amount is already raised. Now that Sana’s family has the amount in hand for her treatment, we all pray for her speedy recovery and good health.